Like the great watery beasts of fictional lore, Chris Crooks' grass-bound, giant squid brings fantasy to life. His magnificent monster adds a dramatic statement to green spaces as it rises up through waves of grass and inspires uproarious reactions from all who cross its path. 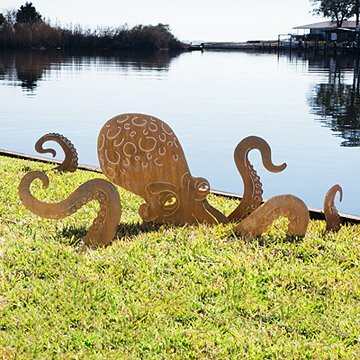 Crooks crafts each four-tentacled beast from pieces of hand-cut metal that are aged with a bright rust patina. He then bends and shapes his tentacles, suckers, and bulbous head, giving the piece added ferocity and dimensionality. Segments affixed with mounting brackets that hold 6" stakes. Handmade in Arizona. Such a great addition to my backyard. Nice solid design that is easy to install. Looks awesome! As I have a host of allergy issues my rock garden is a nice way to still have an interesting view. Your garden sculptures are a great unconventional addition that makes my home fit my personality. It also gives the neighbors something to wonder about. The octopus sculpture looks great by our pool. It was easy to set up and larger than I had thought. It looks very 3 dimensional with the separate tentacles. My grandchildren love it! This year's "staycation" was a great time to relandscape the pool area and back yard oasis. Took out some large, mature shrubs and added "Oakley" and some lemongrass for a fun surprise! I am in the process of xeriscaping my back yard. When that is finished, I will have the octopus installed. It will make a fantastic statement and I'm sure will get compliments and smiles from everyone who sees it! Can't wait to install. The ground is too frozen still. Bought this to go by the pool and we Love it! It's unique and unusual. This was for my mom for Mother's Day and she adores it! It looks so neat in her garden and is such a fun surprise!